Merely studying and observing something cannot teach you what actual experimentation can. The scientific method is central to learning, to progress, to truth. Use a control. Alter variables. Run your tests. Document your results. Then share. Allow others to benefit from your research. 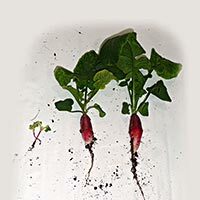 in 12 Homemade Potting Mixes. For 3 years I've been using various types of sub-irrigated containers for gardening. Something that has intrigued me has always been what type of potting mix works best. Or does it even matter? I've used several different mixes in my containers. But I've never objectively tested custom ratios, side-by-side, to see what impact a potting mix will have on plant growth in SIPs. Rather than relying on references passed around by others, I'd like to see for myself. In particular, I want to test potting mixes in my "Albo-stein" (made from the combined use of 32 oz Dannon yogurt & 105 count Clorox wipe containers). This SIP design uses a polyester cord to wick water from below. Moisture levels remain high and do not fluctuate, so long as the reservoir does not dry out. This can create, at least the potential, for water stress from too much moisture in the root zone. I hope eliminate such stress by developing a potting mix that provides enough aeration to plant roots, even when the mix is exposed to a constant supply of water. 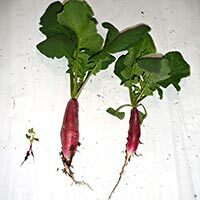 Does the inclusion of silicates such as perlite or vermiculite improve the vigor of a radish grown in a sub-irrigated planter (SIP)? Including silicates in a potting mix will enhance aeration properties and improve the vigor of a radish grown in an SIP. Each yogurt container was filled with the measured amounts of secondary ingredients. Then the container was filled to the top with the primary ingredient. These were dumped into a clean container, mixed thoroughly & placed back into the yogurt container. Three cups of water were poured into the wipes container. Then the yogurt container was placed into the wipes container. Next 6 radish seeds were planted into each container. They were placed in pairs in 3 equally spaced spots. The intention is to thin the seedlings from a maximum of 6, down to 3 per container. 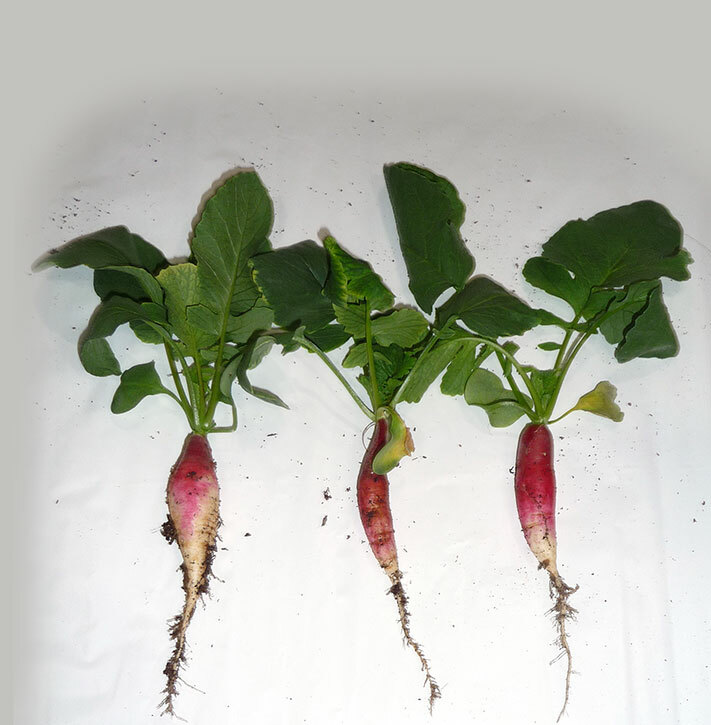 Three radishes per container will help to reduce the possiblity of skewed results due to genetic variation. 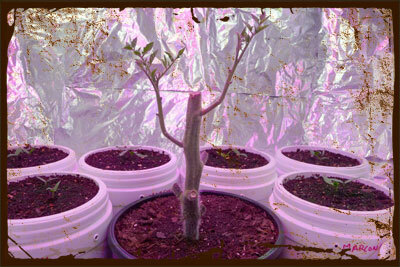 The 12 containers have been placed into an indoor growing chamber which is lit purely by artificial light. 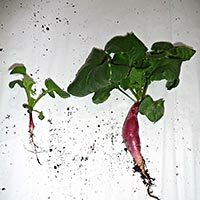 I am using an LED grow light with 3 6500K CFL bulbs as supplemental lighting. A timer is being used to trigger a light cycle lasting 17.5 hours. 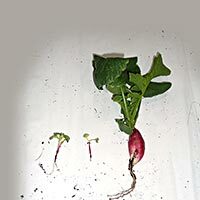 I estimate the total time for this experiment to be 28 days from 1st germination. 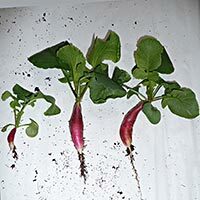 Radishes have been selected due to their compact and rapid growth. 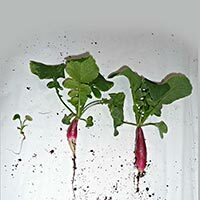 Upon completion, the radishes will be photographed, then uprooted and photographed again. I was surprised at the results of this experiment. First, I need to mention that the amount of fertilizer used was about 4 times what was recommended. 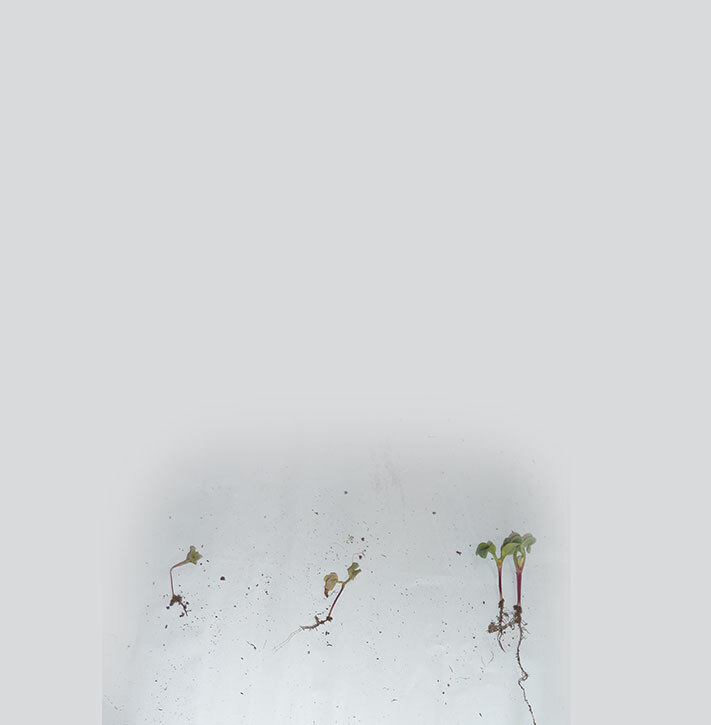 As a result, the higher levels of dissolved solvents made it more difficult for the seedlings to take hold and really start to grow. 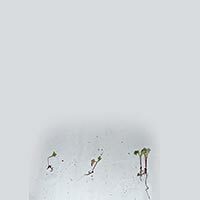 I frequently misted them from the top for 10 days until most had germinated. 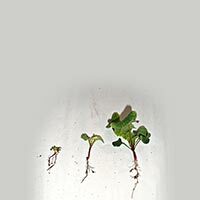 I could observe the small seedlings struggling at first. 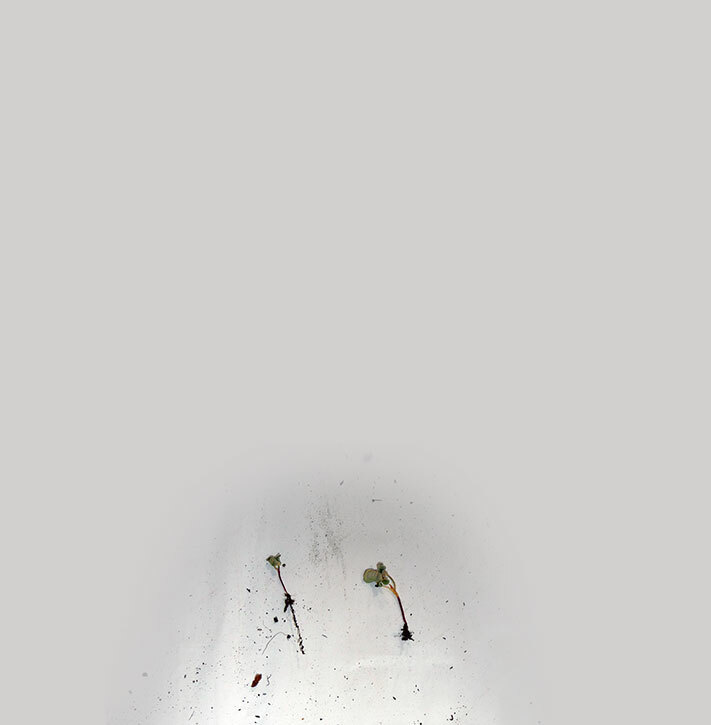 But once they reached a certain point of maturity (1st set of true leaves), they seemed to grow well. I observed a remarkable difference between my two controls. Seedlings planted in 100% Coir 1 did very poorly. The addition of perlite did not help either. 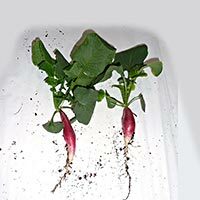 Perlite with vermiculite was still ineffective. But when the mix was supplemented with peat moss they did better. On the other hand, 100% Coir 2 yielded the largest radish of all test subjects. This indicated that the two Coirs were quite different in composition. Coir 2 provided better capillary action, drawing water closer to the surface. Meanwhile, Coir 1 was very densely soaked at the bottom of the container. However, that water did not reach the top layer of the mix. Other samples, such as the peat moss mixes, had satisfactory results. No clear advantage or disadvantage was observed between the different ratios of mixes. Test Results of Radishes in SIP Albo-Stein Containers.